Be the first to share your favorite memory, photo or story of Challas . This memorial page is dedicated for family, friends and future generations to celebrate the life of their loved one. 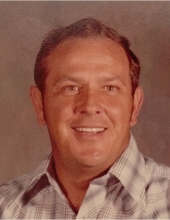 Mr. Challas Leslie Callahan, age 78, of Olive Hill, Kentucky, passed away Sunday morning, March 31, 2019, at Community Hospice Care Center in Ashland, Kentucky. He was born May 29, 1940, in Carter County, Kentucky, a son of the late Curry and Lorene Criswell Callahan. Challas attended the Soldier Wesleyan Church and retired from General Motors as a pipefitter. He enjoyed traveling, laughing, joking and having a good time with his family and friends. In his spare time he loved watching U.K. Basketball, and spending time with his dogs. In addition to his parents, he was preceded in death by one grandson, Michael Andrew Callahan; one brother, Robert Callahan; and one sister, Margaret Erwin. Challas is survived by his wife of 58 years, Joyce Ann Porter Callahan; three sons, Rick Callahan (Becky Sammons), David Callahan, and Bradley Callahan, all of Olive Hill, Kentucky; three grandchildren, Haley (Jonathon) Stevens, Trevor Callahan, and Taylor Callahan, all of Olive Hill, Kentucky; one great grandchild, Luke Stevens; and one special niece, Shirley Erwin of Mansfield, Ohio. He also leaves many nieces, nephews, other family members and friends who will sadly miss him. Funeral services will be held at 2 p.m. Wednesday, April 3, 2019, at Globe Funeral Chapel in Olive Hill, Kentucky, with Nathan Eldridge, Brother Randy Binion and Brother Ed Porter officiating. Burial will follow in the Garvin Ridge Cemetery in Olive Hill, Kentucky. Friends may visit from 6 p.m. to 8 p.m. Tuesday, April 2, 2019, and after 9 a.m. on Wednesday at Globe Funeral Chapel, 17277 West Highway US 60, Olive Hill, Kentucky 41164. Rick Callahan, David Callahan, Bradley Callahan, Johnathan Stevens, Michael Lowe and Hunter Sammons will serve as pallbearers. "Email Address" would like to share the life celebration of Challas Leslie Callahan. Click on the "link" to go to share a favorite memory or leave a condolence message for the family.